All month long I’ve been cleaning and doing a little organizing around the homestead. And I’ve also been thinking of some upcoming home makeover and decor projects! I’ve been browsing Lush Decor, and they have some great items for the home. I especially love their bedding sets. I have a couple of bedspreads that I swap in and out, but I haven’t bought a new one in a while, and I’ve really been wanting to do an update. Lush Decor has some beautiful colors and fabrics and everything looks to be very well made. I also love all the modern designs they offer. Any one of their bedding sets will easily give a fresh and luxurious look to any of your bedrooms. I’ve selected just a few of my favorites to showcase here. What do you think? The site also has a wide selection of window treatments, including curtains and valances, as well as shower curtains, pillows, table clothes, and more. Beyond the great looking products, I’m happy to say that all the items are well priced and well within my budget. On top of that, they have a lot of clearance items, and they offer FREE SHIPPING on all orders over $50. Giveaway! 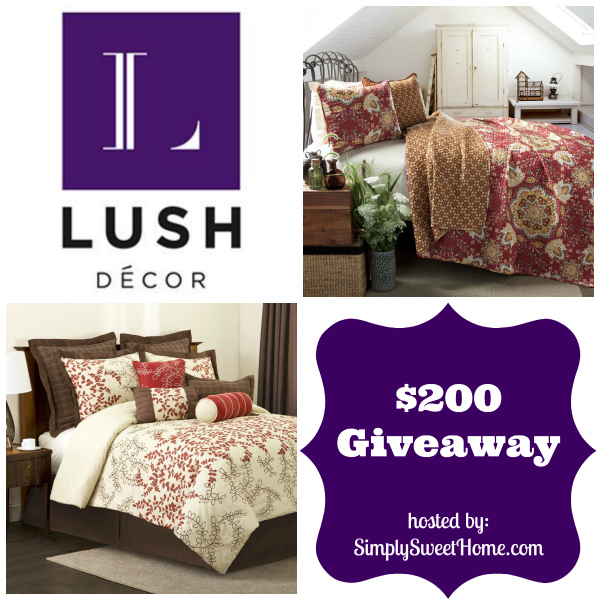 I’m very excited to offer one Simply Sweet Home reader a $200 Gift Card to Lush Decor. I’d like to get the Ruffle Shower Curtain. I would choose the Darla 4 Piece Comforter Set from the Lush Décor site. So pretty!!! I’d love to own the Flower Texture 8 piece Comforter Set! Oh I really love the Hester 8 piece Comforter Set! So pretty! Love the Mia Shower Curtain. I love the Ruffle Window Curtain in Cream Color for my bedroom! I would love to get the Bianca comforter set. I tis so pretty! I’d like to get the Parry 3 piece Quilt. I would get the Lori bamboo fiber throws. I would like to get the Mia 8 piece Comforter Set. I would love to have the Boho Stripe quilt set from Lush Decor. I love the Ruffle Shower Curtain! I’d love to get the Berlin 3 piece Quilt! I would love the Geo Blackout Window Curtains. I’d like to have the Night Sky 2 piece Table Cloth. Thanks. I would love to have the Royal Empire 3 piece Quilt for my granddaughter’s room. I love the Lux 6-piece Comforter St in the color Gray. I like the giselle 3 piece conforter! I like the Rosemonde 5 piece Comforter Set! I love the Bianca 4 piece Comforter Set! So pretty! I want the Boho Stripped Quilt. It has been so cold lately and I would love to be able to wrap up in this to keep warm. I also like the Lake Como comforter set just because it looks so soft and comfortable. I may never get out of bed if I have this set. I would get the Layla quilt set and some coordinating curtains. No more boring bedroom! Addington 3 piece Quilt in red and beige. I would really love to get the Lux 6 piece comforter set in White. 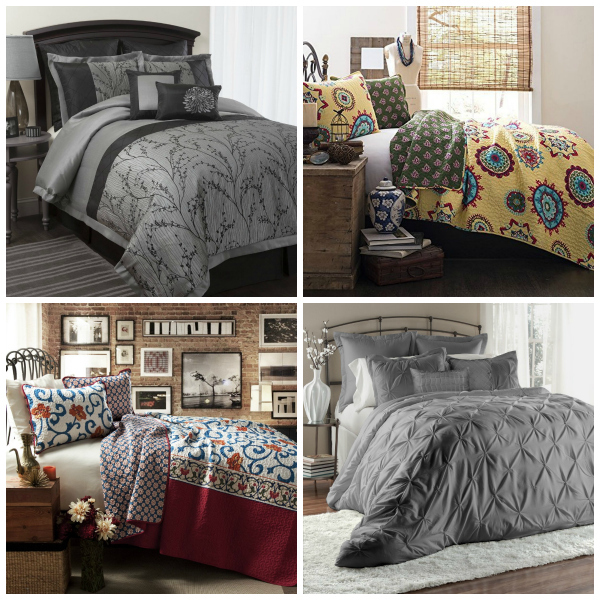 My husband and I both love the Mia 8 piece Comforter Set. I love their quilts! I think the Misha 3 piece set might be my favorite! I have been to this site multiple times (because of giveaways like this) and this time I checked out their clearance section again. 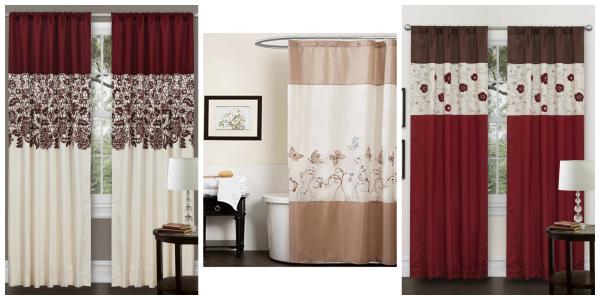 I found so many shower curtains there that are gorgeous, many that are $19.99! With $200 I could get all of them and give them away as Christmas presents! Of course I think my favorite one was more than $20 in the clearance section (look towards the bottom of the first page) and it looked like cherry blossoms falling down. Just beautiful! I love great deals but this one I actually might spend the extra money on because I love it so much!